within a 5 mile radius of Plymstock, Plymouth. 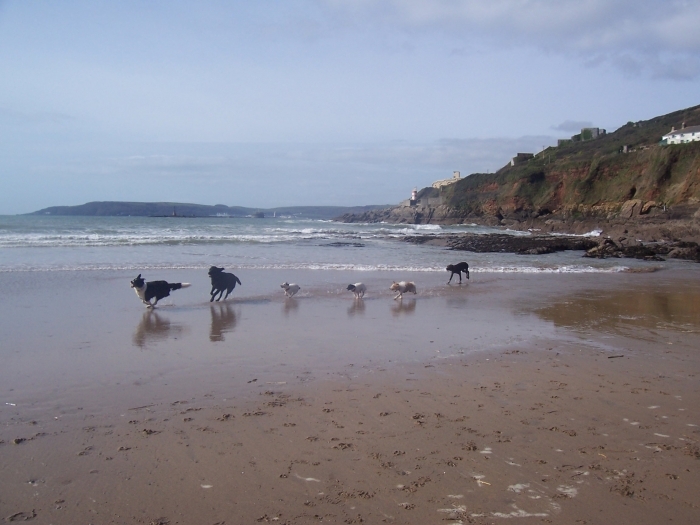 I started my dog walking business four years ago and it has gone from strength to strength. I am very lucky I get to do a job which I thoroughly enjoy. I get a huge amount of pleasure from walking all of my dogs. The first walk your dog will have with me, will be on its own so I can form an assessment of his or her behaviour. Part of this first walk your dog will be on a lead. Once I am happy with how your dog responds to me then I will let your dog off the lead. Recall is very important so if there are problems with recall I do have some techniques which aid the problem. 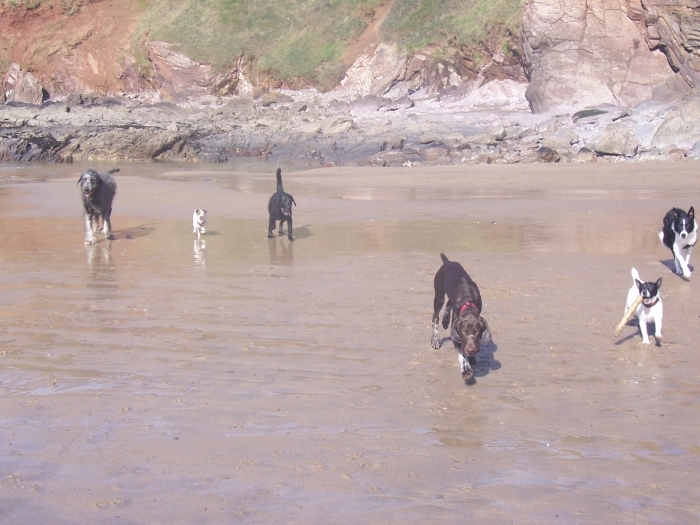 However once I have assessed your dogs behaviour I can then consider integrating your dog with other customers dogs with the aim of having all the dogs off the lead having a terrific time. 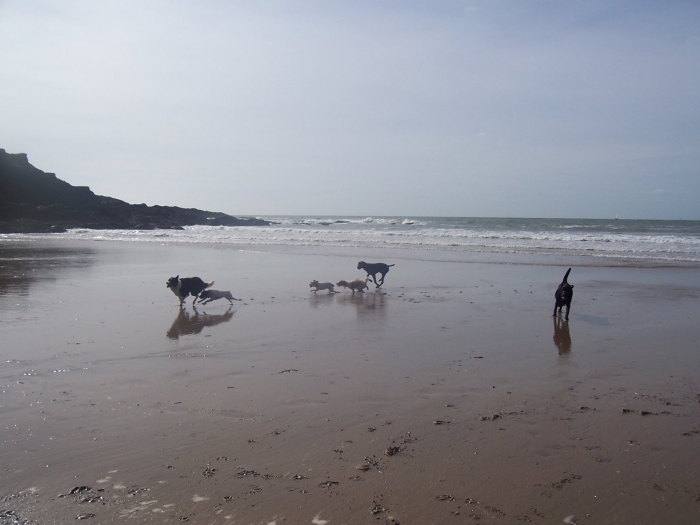 It is at this point your dog will have the benefit from socialising with other dogs and have a great walk which is giving them far more than just physical exertion but mentally stimulating them also. 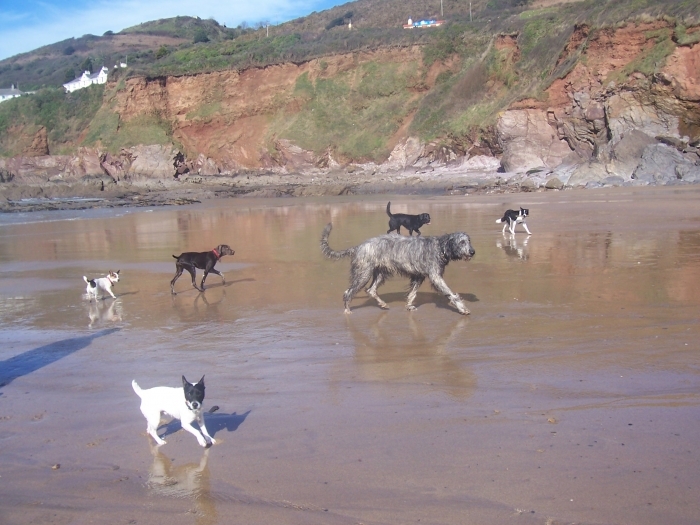 Dogs are pack animals and do enjoy playing with other dogs. The number of dogs I walk at any one time varies from just one (if a dog doesn’t mix with others at all) to usually between 4-5 dogs. Seeing the dogs racing around having a wonderful time is the most amazing experience. The best part of my job is seeing happy dogs playing with other dogs. I am insured to walk up to six dogs. I walk in a variety of areas such a Radford Park, Jennycliffe, Dunstone Woods, Billacombe Fields, Buddle Woods and some sports fields such as the Rugby Playing fields at Staddiscombe. Though some sports fields I rarely use due to the dog control order in Plymouth. I do encourage dogs to play ball however if there are any dogs who are ball possessive then I don’t use a ball at all. I do NOT throw sticks. This is a hazard posing a potential threat of serious injury to your dogs throat. I provide the leads all that I ask of the owner is to ensure a doggy towel is left out for me to clean your dog with when I return your dog home. I do a basic clean of paws and tummy. I take appropriate measures to ensure your house will not be spoilt by muddy paws however I do not make your dog spotless, but presentable! I do not give any of my customers dogs treats without express permission from the owner (due to allergy problems some dogs have). All of my dogs wear one of my collars (I have a vast array of sizes) which all have one of my identity tags on with my contact details on. I carry an extensive first aid kit in my car and will perform appropriate first aid as required and will take a dog to the vets if appropriate. I also keep anti-histamine in the car for any possible threat of anaphylactic shock from a bee sting or wasp sting, though I am not licensed to carry a quick acting anti-histamine. I also have a dog mobility sling lead. My working day starts from 9am and ends at roughly 3pm. The majority of my dogs are walked between 11am and 2pm to accommodate the needs of the dog being left on its own whilst the owner is at work. I am very flexible in as much that although a lot of notice is really good I can do “add ons” relatively easily so I am more than happy to take on a late add on once I know how your dog mixes in with the others. I have two basic dog walking rates for half an hour or one hour. (which does not take into consideration distance so occasionally I add on a £1.50 for petrol). If a dog requires walking individually based on behavioural problems then that walk will be £15 (for an hour). A lot of dog walkers are only happy to take on dogs that are walked every day. I am happy to have a dog on an infrequent basis providing I know the dog fits in well then it doesn’t matter to me how often I have your dog. I do also offer a service whereby I can “drop in” to your dog to let him/her out for a quick toilet break and feed his/her meal. This is roughly a 15 minute break. Likewise should your dog be poorly and you want a visit then this is ideal to have him checked over – I will make a full assessment and then update you with a text message or if more appropriate a phonecall. After the first walk and sometimes the second walk I will send you a text to confirm how everything has gone. This will save you worrying about your dog. After a walk I will leave notes to let you know how your dog has been. I try to give you an idea of how happy your dog is. If there is anything of concern to talk about I will leave a note asking for you to phone me at a convenient time. I like to take on board the dogs needs and the owners requirements. I treat my customers dogs like my own and I will always do my level best to give you the support you may need in any aspect of dog ownership. My service is very flexible – if you think there is a chance I can help you then there is a good possibility I will! If you are getting married and want your dog to be in attendance then I can help support you through the idea to help you achieve your dream of having your important doggy friend with you on your big day. If you suffer a bereavement then I know how important it is to have your dog with you in times of need, so providing the vicar in attendance is fine with the idea then I can certainly help assist with taking a dog to a service. If you are moving house and you don’t want to worry about your dog then I could very well be the person you need to call. If you need to go away for a weekend or on holiday but don’t want to put your cat into a cattery, I can come into your home daily or twice daily until confirmation of your return. I will feed your cat and obviously change the cat litter daily. I make daily assessments of your cat to ensure he/she is well. I can administer medication as required. If you are abroad and I am concerned about your cat I would, dependant on the nature of my concern either make an additional visit that day or if appropriate I would take your cat to the vets. (so you would need to leave a cat basket available – though not essential as I do have a cat basket). I have two rates for cat sitting. 1st Visit of the day is £7.50. If a multiple cat household this is for up to 2 cats. If more than 2 cats my charge is increased by 50p per cat on the first visit and the second visit only increases to £3.50 regardless of number of cats. I am also happy to look after rabbits, guinea pigs or hamsters etc. This rate would have to be discussed. Any animals in my care are constantly monitored for health, I will bring to your attention anything that causes me concern. I am happy to give advice on health issues on the basis the owner is responsible for choosing the advice they act upon. My dog has greatly enjoyed and benefited from this thoroughly professional, friendly and reliable service for the past four years. Without hesitation I recommend Heidi for dog walking.